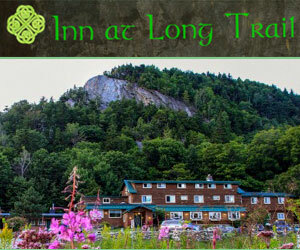 The Inn at Long Trail has been hosting skiers, hikers and people who love the mountains since 1938. Originally built as the Deer Leap Chalet and then the Long Trail Lodge, the Inn was the first lodge in Vermont built specifically for skiers. The McGrath Family took ownership in July 1977 and restored the Inn to its current rustic splendor. Hard wood floors, tree trunks as supports and beams, Adirondack style furniture, split log stairs; stone fireplace and a redwood hot tub grace the interior. The Inn is also known for being the home of McGrath’s Irish Pub featuring live Irish music on weekends, a truly fine pint of Guinness, and a delicious pub menu daily. Enjoy candlelight dining in the main dining room, built around an indoor boulder with a great view of the “Rock Garden”. The Inn at Long Trail is easy to find on US Route 4 in Vermont’s Green Mountains, between Rutland and Woodstock, Vermont – near Killington, Pico and on the Long Trail, an ideal location any time of the year. A highly recommended Vermont Inn and Pub. Ask us about Killington lodging. If you would like to add your Killington area Vermont Country Inn, Lodge or Bed Breakfast Inn to this web site, please contact us.